An Edwardian Article - from the Proceedings of the Society of Antiquaries of Scotland, December 10, 1906. 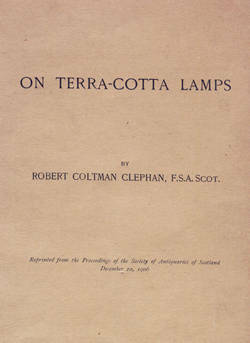 Robert Coltman Clephan, FSA Scot. The following article is of interest since it represents the state of research into ancient pottery lamps a hundred years ago. It should be born in mind however that research since it was published has revealed many errors and inaccuracies. It is presented here unedited. The modelling of these useful though fragile vessels in terra-cotta, that is baked clay, and their enrichment, may be regarded as a fine art; though the domestic lamp is something more than an ornament, for it is a household necessary, and was often a symbol; it was used daily by the living, and was buried with the dead. This branch of ceramics merits more attention from the archaeologist than it has received at his hands. Nothing is known as to the country in which the oil-lamp first appears, but Polydore Vergil is probably right in ascribing the invention to the ancient Egyptians. Antique lamps of this kind were modelled by hand; or the lumps of clay or earth of which they were made, first having been washed free of all granular substances and worked plastic with added moisture, were pressed into moulds, and afterwards sun-dried or baked in an oven or kiln; in the latter process the high temperature cements the mass together, thus rendering the vessel closer in texture and more capable of retaining oil; or, better still for the purpose, many lamps are covered with a silicious slip or with enamel. Probably the receiver was created by moulding the clay around a kernel of wood, which was burnt away in the kiln, leaving the orifice clear. These indispensable utensils, made most frequently of a red or a yellowish-grey paste, are remarkable for their lightness. While the bulk of the specimens preserved are somewhat roughly made, with a view to cheapness, and, like the coarser kinds of pottery generally, were obviously intended to supply the needs of the poorer classes, there has been a multitude of examples found of fine design and workmanship, of rare beauty and finish. Many lamps, first roughly fashioned by hand, were finished off on the potter's wheel, which enabled the modeller to do his work with more precision and in more accurate proportions. Pliny attributes the invention of this very primitive machine to Coroebus the Athenian, hut monuments of the time of the Hyksos or Shepherd Kings, say a couple of centuries before and after B.C. 2000, give representations of it, and the date of its inception probably goes back to a period of antiquity more remote still. The ram-headed god Khnumu, the god of Elephantine, the father of the gods, is represented at Philae as fashioning a man on the potter's wheel. The Egyptian type of the machine is a low circular table turned with the foot. An illustration occurs on a black figured cup in the British Museum; the potter is seated on a stool turning a wheel with his foot. The prophet Jeremiah refers to "the potter working at his wheel," which consisted of two wheels of wood or stone, one over the other, the upper being the smaller. Examples of moulds have been found in considerable numbers; and, like those for terra-cotta statuettes, they were made in parts, and before being used were smeared out with some fatty substance to prevent adhesion. The original model was first prepared in clay or wax, and a mould taken by squeezing on clay, which was then baked. In many cases it is only the top of the lamp that is moulded. A mould in the British Museum—one for impressing the ornamentation—shows how simply, rapidly, and cheaply lamps were prepared for the kiln. Lamps of all grades and periods may be seen in the British Museum, and they record, perhaps better than anything else, the progress and decadence of the ceramic or plastic art. It is regrettable, however, that a better record of the specimens in the Museum has not been kept, and that they are not arranged and classified more with a view to the approximate dates of origin, and mentioning the places where found. This remark applies to many other collections also. By far the greater number of antique lamps are made of terra-cotta, but many bronze specimens have been unearthed, and the general form is very similar in both cases. Lamps were not used for domestic purposes only, but largely in temples and public buildings; and many, more especially those of bronze, hung suspended by chains.